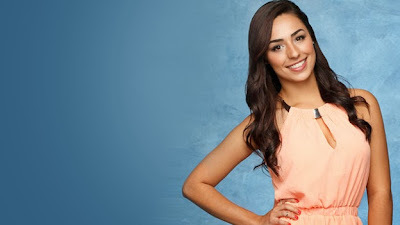 Who are "The Bachelor" contestants? I went ahead and included my thoughts about the contestant bios below. She lives in Tampa (love that place,) seems to have a legitimate job and has a variety with her movies. Also in her bio, she references an "abuela" and "abuelo" the similar heritage could bring them together. I like her loose curls and maroon dress. To be a nanny you have to be very laid back and this could work in her favor, since Juan has Camila. "Hot Spot" Clubs or Low-Key Bars?Both! BANGS! Amy J I am forever thankful that you brought the bangs back. For the life of me I cannot remember who had bangs on Sean's season, so since Rachel, bang envy has been missing in my life. I also like her teal tank top and everyone is from Florida? At least most of these girls won't have to make too big of a move if they get picked. Favorite Sports: Football, basketball, baseball. First of all, Ashley I am so glad you spell it like me. Almost always on the show there are weird spellings which really throw my writing off. At first glance, she reminded me of Kacie B. Her loving Dr. Seuss makes sense because she is a teacher. She loves Scandal, so basically I love her and Scandal. I bet she is very smart and feisty means sass, and I love sass. I am guessing Andi will bring it. Chantel looks fabulous in her coral. She has a huge advantage by living in Miami. If you are not from the midwest or the south you are not here to make friends. Another Miami girl, "As much time as I am given plus a few extra minutes." Wow I hope they go wake up the girls in the middle of the night again and say, "you have to be ready now. Favorite Snacks: Fruit. Cheese. Carrots. Frozen grapes. So she is a science teacher? The midwest is represented this season too! Time it takes to get ready for a big night: 1 hr and 20 min. Apples, peanut butter and marketing, what can I say snarky about that? Time it takes to get ready for a big night: One hour, no more than that. I figured Clare would be from SLC, because that is where all gorgeous thirty something hairstylists live, right? I like that she said, "one hour, no more than that," and she is even a hairstylist. Danielle I hope to see you diffuse some mental breakdowns or fights. ABC should pay her for the environment she is about to go into. 30 minutes to get ready, she seems very laid back which could be great for Juan Pablo. Coral is quite the trend with these ladies. 27 is a good age for the show and since she is a first grade teacher we do not have to worry about her liking kids. I commend her for her normal job title and turquoise tank. "Dog lover?" The scoop is she is a Director of Business Development and volunteers at Angels Among Us (dog rescue.) Either way, the greatness of that coming across my screen is perfection. I love her red hair and another midwestern girl. The last interior designer we had turned out well. I like that she said she could get ready in 45 minutes. Lacy is going to be the one with an inspirational story, I can already tell. Her job title shows she has a big heart. If she "is not here to make friends" my heart will be broken. Hot or cold weather? Hot! Tropical! I really like Lauren's shirt and she is very pretty. A music composer who likes anchorman, I am guessing she has a good sense of humor but can be serious as well. Adventurous or Conservative? Adventurous. Without question. City or country person? Neither. I am an ocean person. If you click on the girls' names it will take you to their ABC profiles. In addition, Lucy's talked about her "best friend Kate Upton." Between that and "free spirit" I need someone to pick me up off of the ground. City or Country Person? American by birth, Southern by the grace of God! Country all the way. So far Maggie is very stylish and is a southern belle. I am sure her accent will win over Juan and her accessories will win over me. Preferred type of dancing: Is drunk dancing a type? I love royal blue, she is a pediatric nurse which shows she cares about kids and then "drunk dancing" made me laugh a lot. Renee fooled me, she looks like a Cali girl. It is not a party until we have a Canadian, I cannot wait for the opera singing mixed with Juan's accent. If Courtney Robertson and Elyse Myers had a baby it would be Valerie. I am sure she will use the personal trainer thing in her favor. Oh snap, I wonder if she will speak Spanish or Portuguese, in addition to English. If she speaks Spanish around other girls, it will be drama. I like her style so far. I am almost older than Cassandra, which is crazy considering I should be studying for finals instead of writing this post. There are mature 21 year olds out there, but considering I am lucky if I get myself breakfast and don't have pizza for dinner (every night,) I think that it is young to be thrown into a stepmom role. Especially if she is not settled yet, but you never know. Florida again, I had to Google where Clermont is and it is also near Orlando. The casting agents must have loved the Amy squared. Hopefully they become friends since they live so close together. I know you are not supposed to just a contestant by their puffy off-the-shoulder shirt, so I will wait and see with this one. All photo and bio rights belong to ABC. For more information about each contestant click on their name. I am so excited for this season! Thank you for more information share in your post.It is very helpfully to people how to search a good family homes. It is a nice post to find a homes sell or sold.If anyone want more information in orland park real estate please visit my site.